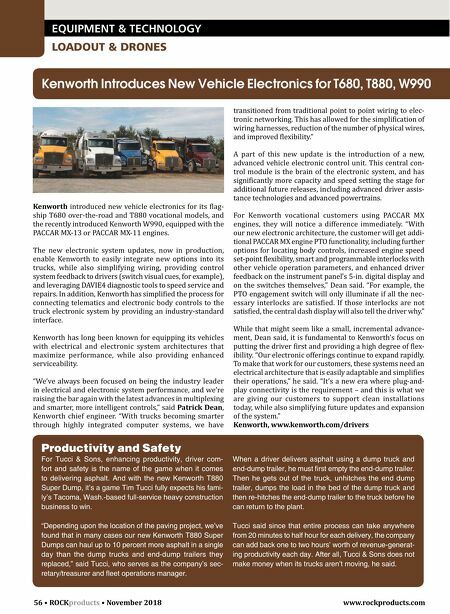 56 • ROCK products • November 2018 www.rockproducts.com EQUIPMENT & TECHNOLOGY LOADOUT & DRONES Kenworth introduced new vehicle electronics for its flag- ship T680 over-the-road and T880 vocational models, and the recently introduced Kenworth W990, equipped with the PACCAR MX-13 or PACCAR MX-11 engines. The new electronic system updates, now in production, enable Kenworth to easily integrate new options into its trucks, while also simplifying wiring, providing control system feedback to drivers (switch visual cues, for example), and leveraging DAVIE4 diagnostic tools to speed service and repairs. In addition, Kenworth has simplified the process for connecting telematics and electronic body controls to the truck electronic system by providing an industry-standard interface. Kenworth has long been known for equipping its vehicles with electrical and electronic system architectures that maximize performance, while also providing enhanced serviceability. "We've always been focused on being the industry leader in electrical and electronic system performance, and we're raising the bar again with the latest advances in multiplexing and smarter, more intelligent controls," said Patrick Dean, Kenworth chief engineer. "With trucks becoming smarter through highly integrated computer systems, we have transitioned from traditional point to point wiring to elec- tronic networking. This has allowed for the simplification of wiring harnesses, reduction of the number of physical wires, and improved flexibility." A part of this new update is the introduction of a new, advanced vehicle electronic control unit. This central con- trol module is the brain of the electronic system, and has significantly more capacity and speed setting the stage for additional future releases, including advanced driver assis- tance technologies and advanced powertrains. For Kenworth vocational customers using PACCAR MX engines, they will notice a difference immediately. "With our new electronic architecture, the customer will get addi- tional PACCAR MX engine PTO functionality, including further options for locating body controls, increased engine speed set-point flexibility, smart and programmable interlocks with other vehicle operation parameters, and enhanced driver feedback on the instrument panel's 5-in. digital display and on the switches themselves," Dean said. "For example, the PTO engagement switch will only illuminate if all the nec- essary interlocks are satisfied. If those interlocks are not satisfied, the central dash display will also tell the driver why." While that might seem like a small, incremental advance- ment, Dean said, it is fundamental to Kenworth's focus on putting the driver first and providing a high degree of flex- ibility. 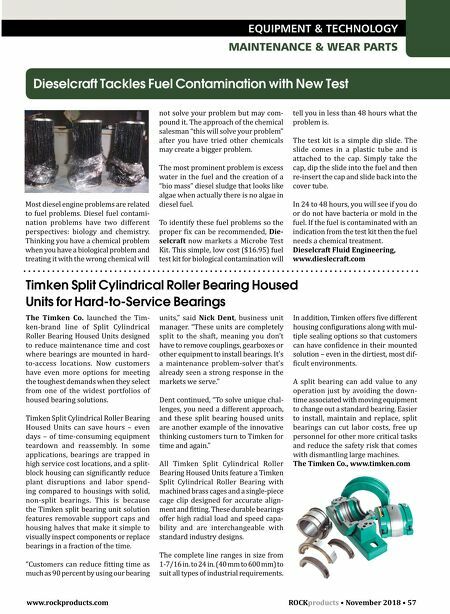 "Our electronic offerings continue to expand rapidly. To make that work for our customers, these systems need an electrical architecture that is easily adaptable and simplifies their operations," he said. "It's a new era where plug-and- play connectivity is the requirement – and this is what we are giving our customers to support clean installations today, while also simplifying future updates and expansion of the system." Kenworth, www.kenworth.com/drivers Kenworth Introduces New Vehicle Electronics for T680, T880, W990 Productivity and Safety For Tucci & Sons, enhancing productivity, driver com- fort and safety is the name of the game when it comes to delivering asphalt. And with the new Kenworth T880 Super Dump, it's a game Tim Tucci fully expects his fami- ly's Tacoma, Wash.-based full-service heavy construction business to win. "Depending upon the location of the paving project, we've found that in many cases our new Kenworth T880 Super Dumps can haul up to 10 percent more asphalt in a single day than the dump trucks and end-dump trailers they replaced," said Tucci, who serves as the company's sec- retary/treasurer and fleet operations manager. When a driver delivers asphalt using a dump truck and end-dump trailer, he must first empty the end-dump trailer. Then he gets out of the truck, unhitches the end dump trailer, dumps the load in the bed of the dump truck and then re-hitches the end-dump trailer to the truck before he can return to the plant. Tucci said since that entire process can take anywhere from 20 minutes to half hour for each delivery, the company can add back one to two hours' worth of revenue-generat- ing productivity each day. After all, Tucci & Sons does not make money when its trucks aren't moving, he said.